Yesterday morning Palestinians from the South Hebron Hills village of Bir al Idd found the sole access road to their village closed by a road block composed of two big stones. These stones were placed precisely in front of the nearby illegal outpost of Mitzpe Yair. When at around 8:30 AM several Palestinian, Israeli and international activists arrived on the scene, they saw the road block (most likely made by the settlers) and a settler shepherd grazing his sheep on the field adjacent to this path. The activists immediately informed the Israeli army so the road block would be removed. Five minutes later Israeli soldiers arrived at the area to monitor the situation, but they didn’t remove the roadblock. The activists then called the Israeli police and waited for about 40 minutes, but the police failed to arrive. 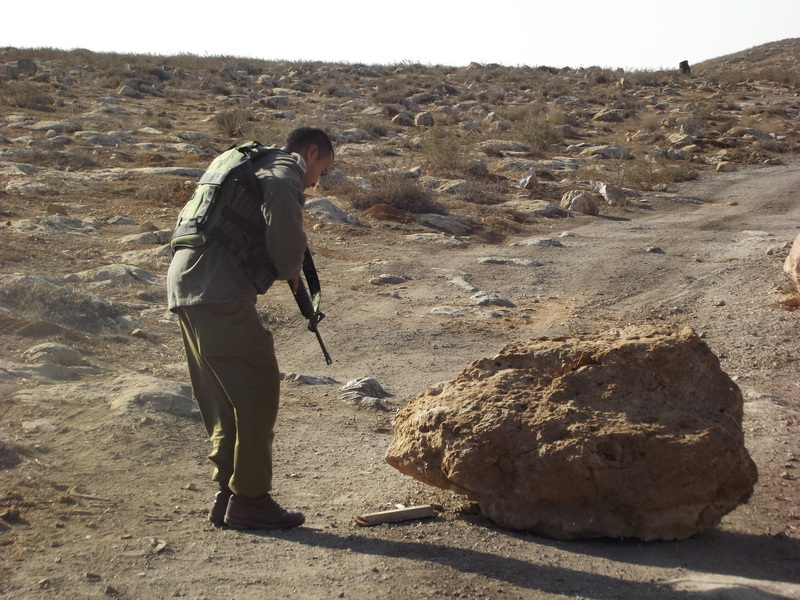 The road block was then removed by the Israeli army at around 1.00 pm. This is not the first time this kind of harassment occurs on this road. 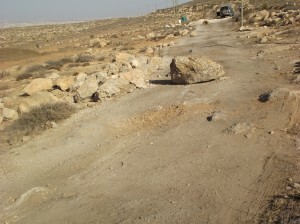 On August 18, settlers from Mitzpe Yair built there twice in one day a road block, which prevented access to the village for over six hours (see more: http://snipurl.com/27ystqj).